These new EFX models are a clear indication of 21st Century drummers' appetites for ever more complicated cymbals. Evolving away from established designs and freely mixing different sonic attributes - some of them verging on contradictory - EFXs are refreshingly different and unashamedly modern. The A Custom models make powerful alternatives to regular crashes. All four of the EFXs positively fizz alongside conventional cymbals. As is customary, Zildjian began the year by revealing a cache of new models to the drumming world. The first selections from this new bronze crop to reach us was a quartet of EFX cymbals. Originally designed for the Remix range, EFXs are highly modern instruments whose defining feature is a series of holes and shapes that are cut out of each cymbal. The EFX design was transferred to the A Custom range in 2007 because drummers were buying the Remix EFX model and removing the jingles that came attached to the cymbal. Since then A Custom EFXs have been spotted on many players' kits from a wide spread of genres. Aside from a pair of EFXs in Zildjian's ZHT series, the design has remained in A Custom territory. Until now that is, as two of the new cymbals are from the K series. The pair of Ks are sized at 16" and 18", while the two new A Custom models are in 14" and 20" diameters, neatly book-ending existing 16" and 18" A Custom EFXs. EFX cymbals resemble regular cymbals in nearly all aspects; the difference lies in what's missing. Three cigar-shaped cut-outs radiate outwards at intervals of 120 degrees. Between each cut-out are patterns of four holes. These are spaced evenly, with three following the curve of the cymbal in a line while a single hole is placed closer to the bell, making a triangular formation. The presence of the cut-outs influences the tuning of the cymbals, encouraging conflicting frequencies. They also interrupt the flow of energy across the cymbals, making them decay quicker in a process that could be compared to short circuiting the vibrations. It's worth noting that Dave Grohl used a prototype 20" A Custom EFX. Grohl's drum tech, Gersh, recently described his ideal cymbal as one that sounds naturally as though it's been compressed, adding that the 20" EFX fitted the bill perfectly. 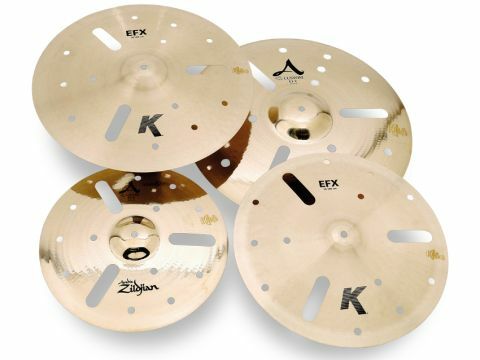 The pair of all-new K EFXs has been created because of requests from UK drummers for mellower versions of EFXs. They are easily distinguished by their traditional finish, in contrast to the brilliant finish of the A Customs. The two ranges also differ in weight, with K EFXs being classified as thin while A Customs are paper thin. An unintended side benefit of the apertures cut into the EFXs is the ease with which the cymbals can be picked up and placed on a stand. The first to submit was the 14" A Custom which opened quickly in a bright, aggressive manner. Its sound was recognisably that of a crash cymbal, but one with a distinctly trashy slant. The main body of sound decayed quickly and suddenly, leaving a quieter residual wash to subside slowly. This was only audible in isolation; in a playing situation it would be, to borrow a phrase, crash'n'go. Listening to the decay I could detect some oscillation, which was, no doubt, a product of the cut-outs. Being a much larger cymbal, the 20" A Custom was an altogether different and wilder beast. It delivered shattering attack with a seething, trashy tone that rose above everything else for the moment it erupted before rapidly decaying. As with the 14" model, once the opening crash had choked back, a longer but quieter decay took over. The combination of the toppy and trashy elements gave this cymbal piercing but shimmering qualities. Where china cymbals are abrupt and dry, this EFX behaved technically more like a crash, swelling and dissipating. The frequencies involved and the ferociousness of the response suggests a blurring, if not a redrawing, of boundaries. "The frequencies involved and the ferociousness of the responses suggests a blurring, if not redrawing, of boundaries." The two K EFXs were darker variations on the theme. Much deeper voiced, their sound was that of warm crashes being skewed with trashiness. This made them aggressive, but not blindingly so. Both produced a slightly gongy 'pah' when hit, which then became integrated with the rest of the crash. They sat well together and gave a musical response that was loaded with sharp urgency. An unusual, but captivating blend of sounds and tones.